Thanks to a ton of feedback, we've learned that it's critical for brands to be able to present their videos beautifully on their Instagram profiles. We're happy to share that Pro and Business plans now include the option to edit video covers through Buffer! Feel free to check out this this handy guide to custom thumbnails and cover images in our knowledge base. 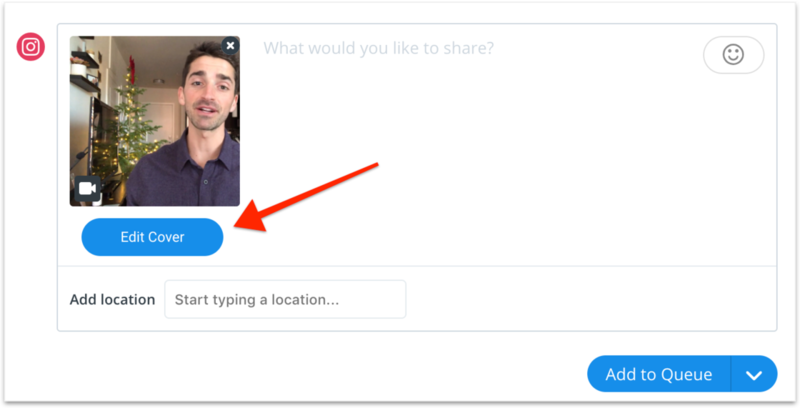 Previously, we’d send you a reminder to manually publish your video post in the Instagram app. Not any more! This improvement means that Buffer will take care of both scheduling and publishing from start to finish. Wahoo! Facebook page mentions are back! We’re thrilled to share that you can now mention other Facebook Pages when you share a post to a Facebook Page. To mention a Facebook Page when creating a post, use the @ symbol and start typing the first few letters of the Facebook Page you’d like to mention. Buffer will show you a list of matches and you can click on the Page you'd like to include. Learn more about Facebook Page mentions. Available on all Buffer Publish plans. We hope to bring it to our mobile apps soon too! Facebook Profiles: From today you will no longer be able to post to personal Facebook Profiles using Buffer. To learn more about this change and the difference between Facebook Profiles and Facebook Pages, please read this help article. Facebook Pages: Unaffected by this change. You can still connect and post to Facebook Pages using Buffer. Facebook Groups: You can still connect and post to Facebook Groups that you manage using Buffer. The steps to connect a Group to Buffer have slightly changed. Here's how to connect a Group. We understand how disruptive changes like these can be and will continue to do everything we can to support your social media success! Ultimately, we believe this shift from Facebook will have a positive long term impact for the entire ecosystem, including brands and marketers that use healthy social media strategies with tools like Buffer. We're excited for the future ahead. Thank you for being on this journey with us and for your support. We've just released two improvements to help you with your Instagram posts! 1) You can now add a location when you schedule a post directly to Instagram from your Buffer dashboard. 2) You can now schedule up to four gallery images. We can't post these directly on your behalf; we'll send you a reminder instead. For more details about reminders and how Buffer works with Instagram, feel free to read this knowledge base article. Twitter recently announced changes to their platform to prevent people from misusing multiple accounts to artificially amplify a message. Specifically, their changes mean you can no longer post to multiple Twitter profiles at once from any third-party tool, including Buffer. To comply with Twitter’s terms of service, we’ve made an adjustment to Buffer so that you will only be able to schedule content to one Twitter profile at a time. You will still be able to schedule content to multiple Twitter profiles with one Buffer account, just not the same message to multiple Twitter profiles simultaneously. Although these kinds of changes can be a little disruptive at first, we think this is great news for the Twitter ecosystem, and we believe that our new composer experience is a small step towards helping marketers create authentic content. We’re currently exploring solutions to make posting unique content to multiple accounts easier and streamlined while doing the right thing by the Twitter community. For example, we have plans to help you create unique content for multiple Twitter posts in the same composer session and are exploring ways to help you easily schedule retweets for related accounts. We’re keen to be very mindful of how a change like this might impact you and, as always, we’ll be listening to your feedback about how we can best serve your needs moving forward. 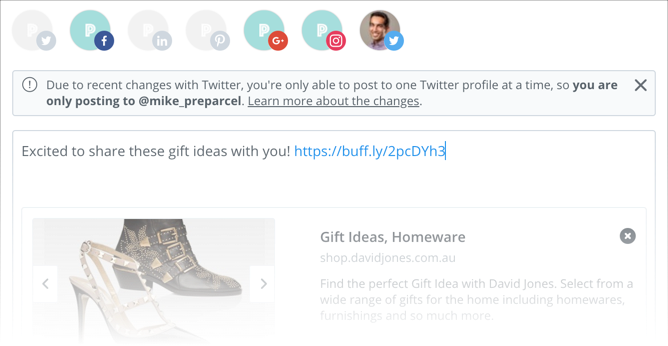 We’ve now fully rolled out a new and improved version of the Buffer composer that allows you to create unique posts for each social platform - all in one place and all in one go! 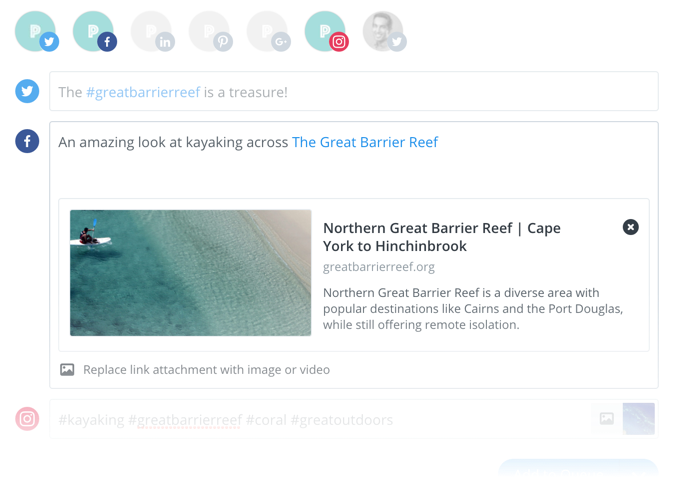 With this new experience, you can do things like mention other Facebook pages, add hashtags for Twitter, share the perfect image to Instagram and much more! The goal is to help you create authentic and engaging posts for each platform in a quick and easy way. Learn more about the benefits of customizing posts. Available on all Buffer Publish plans and coming soon to our mobile apps. Woohoo! You can now schedule single-image posts to Instagram without having to manually finish the post in the Instagram app. For the moment, there are a few important limitations to what Buffer can post directly to Instagram. You can read more about those limitations here. For any of your scheduled posts that Buffer can’t post directly, we’ll let you know after you create the post, and will send a notification to you via the Buffer app on your mobile device once the scheduled posting time comes around. In these cases, we’ll help you finish the post in the Instagram app, where you can add things like filters and photo tags. Learn more about Buffer for Instagram. Direct scheduling is available on all Buffer Publish plans. We’ve made a few changes to how you can manage the Posting Schedule for a social account, which we hope is clearer and easier. It’s a simplified view of your entire schedule, with the ability to turn days on or off with a single click. We’ve also moved the Posting Schedule to the Settings tab for each social account, to help keep the dashboard neat and tidy. You can learn more about how to set up your Posting Schedule in our knowledge base over here. Surely Buffer will start publishing changelogs very soon.